Tana French’s story about a man returning to his hometown to investigate the disappearance of his former girlfriend, decades later, is hailed as one of “the most important crime novelist to emerge in the past 10 years” by The Washington Post. Winner of the Baileys Women’s Prize for Fiction, Eimear McBride tells the story of a young girl’s devastating adolescence as she and her brother, who suffers from a brain tumor, struggle for a semblance of normalcy in the shadow of sexual abuse, denial, and chaos at home. From bestselling author John Boyne comes a sweeping, heartfelt saga about the course of one man’s life, beginning and ending in post-war Ireland, as he grapples with his identity to discover who he is and where he came from. From a childhood illness that left her bedridden for a year to a terrifying ongoing, daily struggle to protect her daughter, this is an extraordinary memoir told entirely in near-death experiences that have punctuated Maggie O’Farrell’s life. 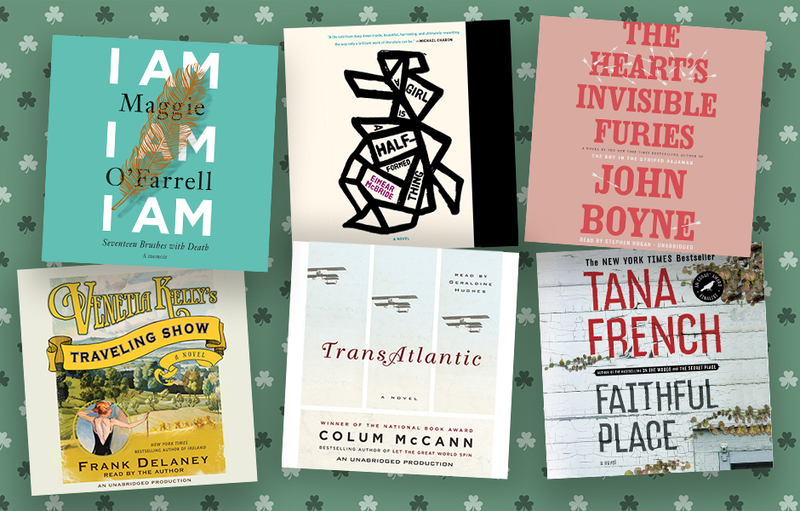 Colum McCann’s New York Times bestselling novel brings us a profound meditation on identity and history through the memorable stories of deftly rendered characters, both real and imagined. Want more listens from Irish authors? Check this out.